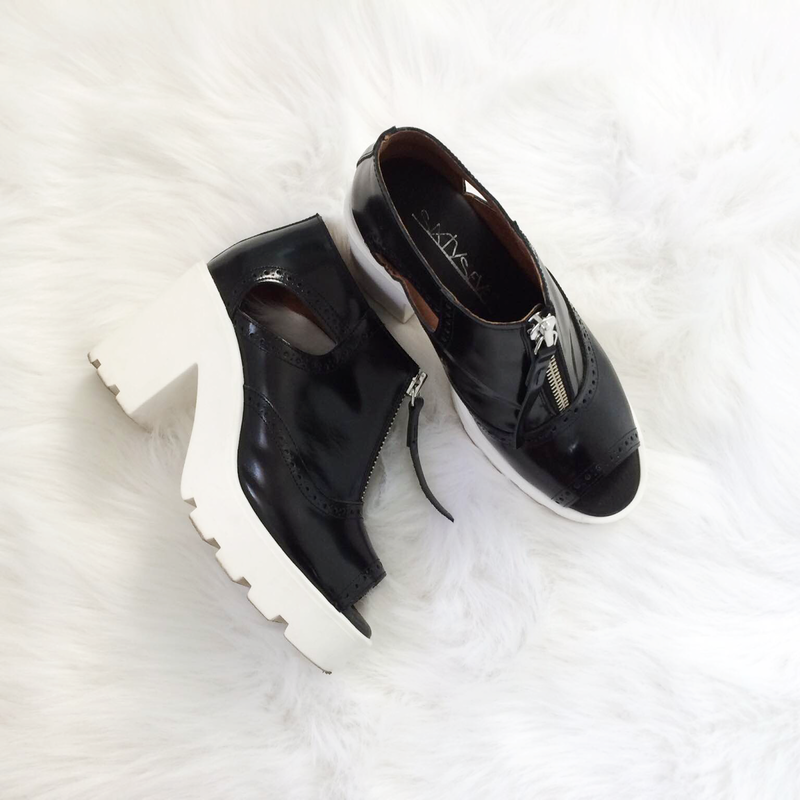 This month's #SHOECRUSH post is all about monochromatic black and white. As someone who wears a lot of black even through the Spring/Summer, it's nice to throw on a shoe that incorporates white to brighten up an otherwise dark and broody outfit. On the occasions where I choose to wear colour, these will all make for easy pairing because they won't colour clash. Keep reading for my run-down and review of all of the above! Now these are most definitely statement boots! They are a similar silhouette to what I'm used to and aren't too far of a stretch from what you'd typically see me in on a night out. I think what gives these that undeniable "cool-factor" is the cracked white leather upper and rubber mudguard. They've got great traction and sturdy rubber heel which adds a little bounce to your step. They are lined with a minimally treated leather which means they will stretch and break in like a dream. They are waterproof up to the mudguard although I wouldn't dare to wear white leather boots in the rain under any circumstance. I've worn these once with an LBD and oversized bomber and they looked A++! I've just moved apartments and these have been a go-to shoe in all the running around that goes along with moving house. They are super comfortable and offer great arch support. I usually wear a size 8.5 US (that's a 39 EU, 6 Mens, or 6 UK) which is what I purchased in these. I wish I would have sized up because I am definitely cutting it close with these although they are still wearable. These are a must have this summer. Keep them by the front door and make them your easy summer staple. I've worn them with everything from sweatpants to boyfriend jeans to maxi dresses - you can't go wrong! These are the perfect shoes to bridge the day to night gap. The shiny box calf leather dresses them up and adds a tinge of luxe while the white rubber platform sole adds comfort and a sporty feel. They'll be perfect with denim cutoffs, a sassy hat and a black kimono or simple jeans with a white tee. Sixty Seven shoes are all made in Spain and use high quality materials. The insole is extremely padded on these and they are leather lined, making them super suitable for long days (or nights) on the town. These are classic kicks that everyone needs in their arsenal. I've been compulsively scrubbing mine to keep them looking new and have stocked up white laces to freshen them up whenever they start looking dingy. They make everything look effortless yet sharp and are must-have for Spring in my opinion. If you are looking for a pair of cool and simple sneaks by a trusted brand but don't want to break the bank, you should definitely look into these.